Soc'ing Out Loud: Science vs. Religion: Why the Stark Differences in the Gap between Opinions of General and Personal Conflict? Science vs. Religion: Why the Stark Differences in the Gap between Opinions of General and Personal Conflict? A few things surprise me. 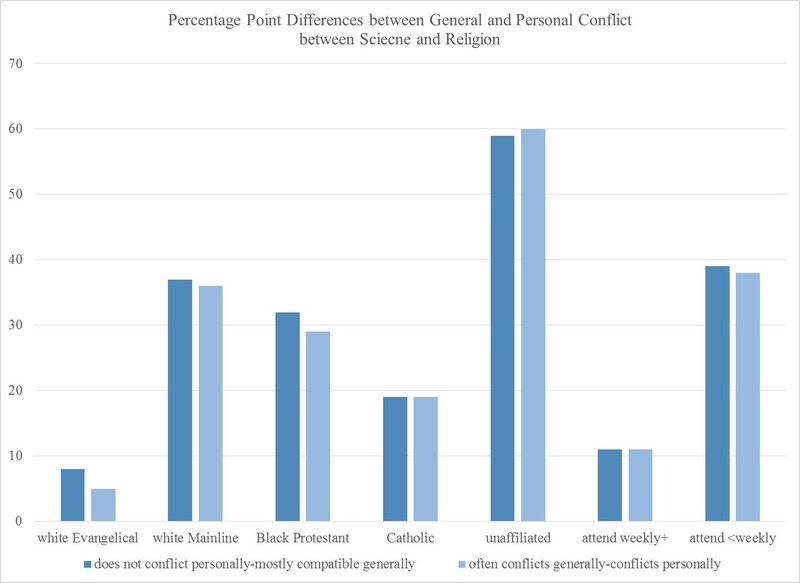 First, white Evangelicals are relatively unlikely to see conflict/more likely to see compatibility between science and religion compared to those of other religious traditions. Second, the unaffiliated are exceedingly likely to see conflict/unlikely to see compatibility between science and religion. Third, those who attend worship services weekly or more are less likely to see conflict/more likely to see compatibility than those who attend worship services less than weekly. All three of these relationships are the opposite of what I would had guessed. 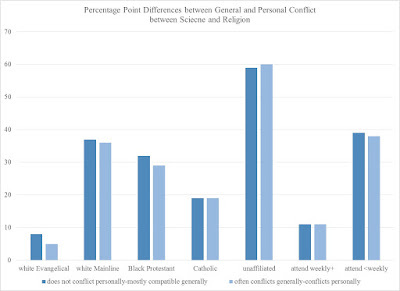 White Evangelicals are surprisingly unlikely to see much difference between the religious/scientific conflict generally versus personally. Nearly as unlikely to see much difference are regular attenders. On the other extreme, the unaffiliated are likely to see stark differences. Since we know that they typically have conservative theo-political beliefs, it's likely that white Evangelicals and regular attenders hold a belief of "science" that is inconsistent with scientific consensus. Since this is the case, white Evangelicals and regular attenders simply don't observe any conflict socially or individually between "science" and religion. The unaffiliated, on the other hand, are more likely to hold beliefs about science that are consistent with scientific consensus and to note that some large, vocal groups (e.g. Evangelicals) hold "scientific" views that are at odds with the consensus. Thus, the unaffiliated observe pointed conflict socially, but very little personally, between science and religion. An alternative interpretation (though I find it highly unlikely) is that white Evangelicals simply find the societal claims of a science/religion divide overblown and that the unaffiliated exaggerate the conflict that others, like Evangelicals, actually experience and perpetuate.